This bouquet composition consists of roses, wild flowers, basil, rosemary, olive, and some purple and yellow desert blossoms. Gathered from the yard and placed in a petite black cauldron. 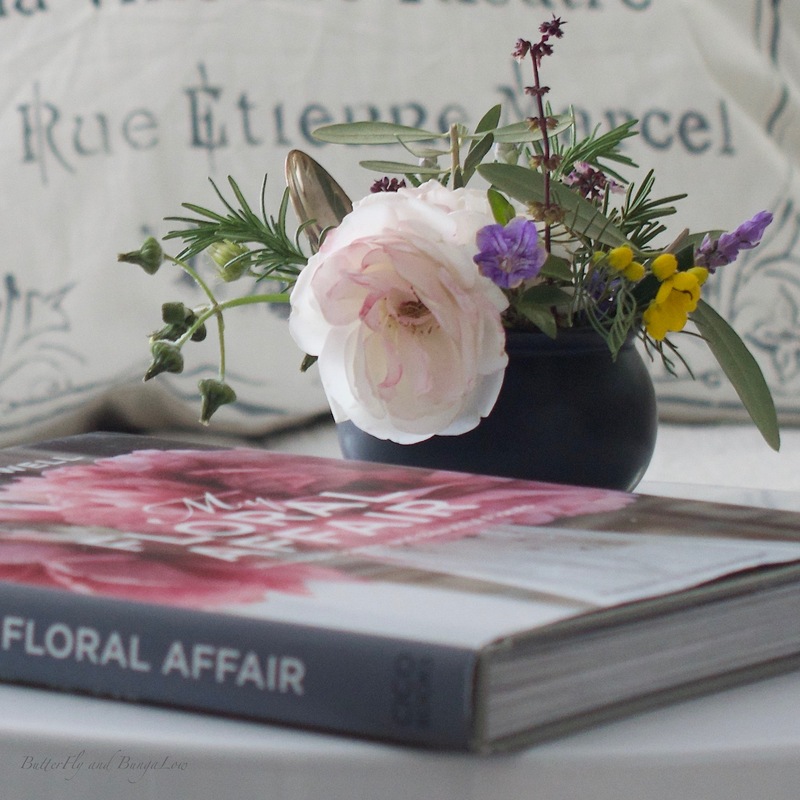 This newly released book is by Rachel Ashwell and it's called My Floral Affair. Inspired by the cover of this book, for the bouquet in this little pot I added a silver vintage teaspoon. Her bouquet contains a spoon with a message, which I loved, because here we love anything that alludes to Alice in Wonderland. In the back of the book is inspiration: diagrams on how to make the bouquets in the book. I think that these would be expensive to replicate exactly. However, just look at the shapes of the flowers and what could be substitutes from the backyard or from the specials at the flower mart or store. In conclusion, this book could make a gracious gift for a shabby, French, Nordic, or English cottage lover, gardener, or artist. This post is my opinion, and there was no compensation. That is a darling composition and the added spoon is an unexpected point of interest. Speaking of interest, the book looks beautiful and very interesting. I love your inspiration floral arrangement. You nailed it, Su! I love the herbs in the bouquets! Hey I agree with Ricki above, you NAILED it. And of course I'm going to borrow some of your ideas. I have lots of great growing rosemary outside and have never (duh!) thought of adding it to a small bouquet as you have. It's such a cute idea, and I'll bet it smells marvelous. I have this book checked out at the library. I am on a wait list. Looking forward to reading it. Thank you for sharing and I love your bouquet idea! I thought about getting this book to see all the pretty arrangements. Glad to see your take on it here in your post. Have a great rest of the week. Happy Wednesday. Sue, what a beautiful arrangement! 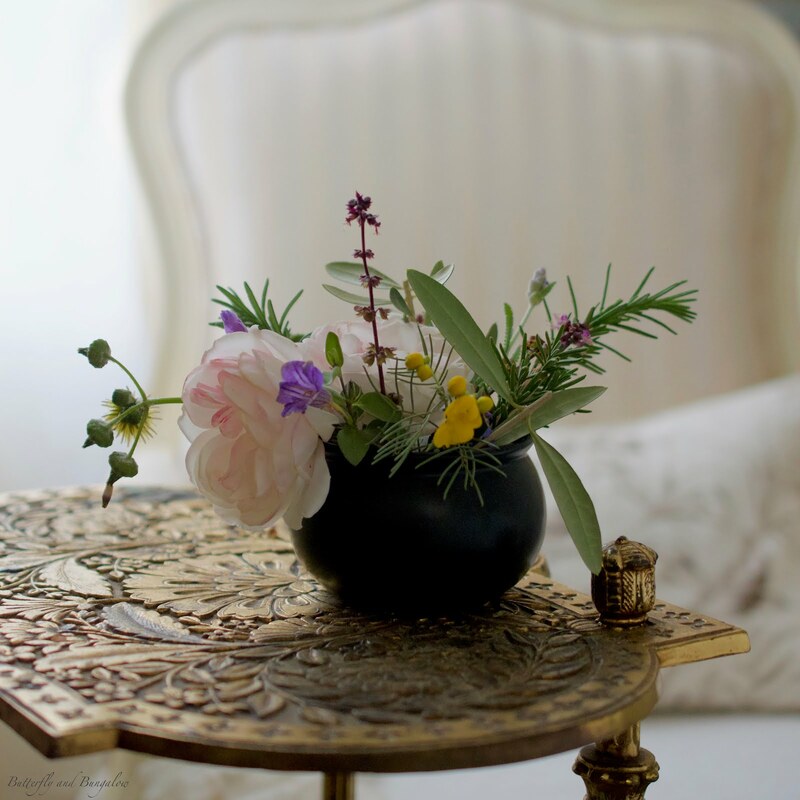 I've always especially liked small floral arrangements with a natural look that incorporate herbs and other "extras." You have such a talent for arranging florals, Su. 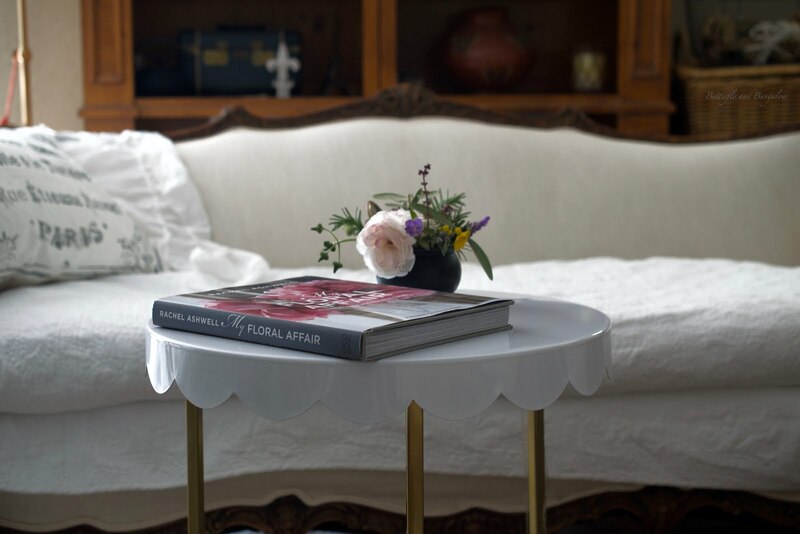 Just that little pop you add to your already gorgeous home. Have a nice day, sweet girl. How pretty...I love the unexpected touch of the spoon. Thank you for the book suggestion, it sounds great. Lovely! We have a branch of Laduree not too far from me in NYC. I think I'm overdue for a visit there. Su, your arrangement is absolutely beautiful. I love it even more knowing it came from your yard! I love your little bouquet, it holds all the promise of spring.